Energy Magazine’s Associate Publisher, Editor and International Director, Morton Large, and five people have received the “Service of Excellence Award” from Interfaith of The Woodlands for their volunteer work. 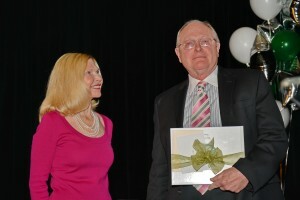 According to a release from Interfaith of The Woodlands, Morton Large was honored at the 9th annual Interfaith of The Woodlands Five Who Share luncheon held Friday, March 1. Interfaith of The Woodlands is a nonprofit agency that provides counseling, information and referral, a food pantry, senior services, a clothes closet and more. Qualifying individuals in The Woodlands, south Montgomery County and the villages of Creekside Park and Sterling Ridge can receive aid. The Rotary Lombardi Award is hosted by the Rotary Club of Houston and benefits the American Cancer Society, MD Anderson Cancer Center and Texas Children’s Hospital Cancer Center. The Award was initiated by the Rotary Club in 1970 shortly after the death of Vince Lombardi to colon cancer. Rotary Lombardi Award is the most prestigious award in college football. In 2012, Energy Magazine’s CEO, Richard Slemaker, served as chairman of this prestigious award. The Rotary Lombardi Award goes annually to Best College Football Player and Leader – who, in addition to outstanding performance and ability, best exemplifies the leadership qualities of Vince Lombardi. As the legendary coach of the Green Bay Packers, Lombardi first made a name for himself as the smallest but toughest member of Fordham University’s “Seven Blocks of Granite,” renowned in their day (1934-37) for being the most unyielding line in college football. In 2015 Richard Slemaker was elected as the 105th President of the Rotary Club of Houston. The Rotary Club of Houston rose to the top worldwide club in new membership for which Richard Slemaker received a nationally coveted “Large Club” President of the Year Award. Richard’s 25 years in national and international business development, media and government relations earned him a National Quality Award.